On the 2 September 2017, the Absolute Propeller-Driven Piston Powered 3-Km speed record was broken by Steve “Steve-o” Hinton Jr, who, in the highly modified P-51D Mustang Voodoo, achieved an average speed of 531.53mph, with the fastest of four laps reaching 554.69mph. This breaks the record (C-1e class) of 318mph set by Will Whiteside Jr in modified YAK-3U Steadfast in 2012. Despite smashing the current iteration of the 3km speed record, the team had high hopes to also break the older, retired record held by Lyle Shelton at 528mph, which was set in modified Grumman F8F-2 Bearcat Rare Bear on the 21st August 1989. Due to changes to the way the runs are recorded, the governing body (FIA) made the Shelton-held record obsolete. In order for a new record to be recognised, the current speed record has to be bettered by at least 1%, meaning that in order for Steve-o to best the retired Shelton record, he would have needed to record a time of over 533.6mph. The retirement of the old timing system, however, opened the door for the record to be reset at a slower speed, which Will Whiteside had done in Steadfast. Despite the fact that Steve-o did not reach the 533.6mph needed to officially beat the Shelton record, it’s a bit of a moot point being as it is a retired record which will stand regardless – and, in any case, 531mph bests 528mph – meaning that Steve-o has just set the fastest piston-powered propellor driven speed record to date. 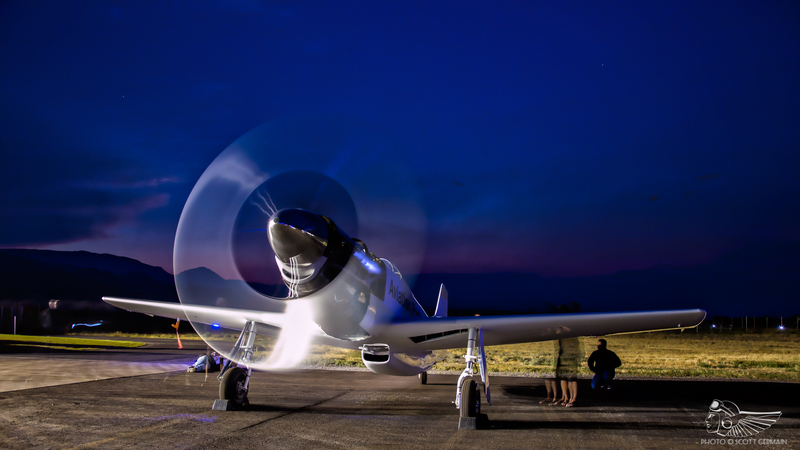 Following in his father’s footsteps, Steve-o has been a regular competitor at the warbird speed mecca of Reno for nearly a decade, cutting his teeth in 2008’s Unlimited Class where he flew P-51D Sparkie to 3rd place in the bronze heat. Returning the following year at the helm of Strega, Steve-o took the win at 491mph. Since then, he has taken the top spot several times, flying both Strega and Voodoo. The 3km speed record itself has been held by many aviation luminaries, including Jimmy Doolittle and Howard Hughes, to list but two. Since 1939, the record has only been set thrice, firstly by Darryl Greenamyer in Conquest 1, a modified F8F-2 Bearcat, at 483mph. This was in turn broken by Steve Hinton, Sr in P-51 Red Baron – a contra prop Griffon powered Mustang – in 1979 at 499mph. The record then stood for a little over a decade before Lyle Shelton broke it in Rare Bear. We have since interviewed Steve Hinton on setting this record. The Vintage Aviation Echo extends it’s congratulations to the whole team behind Voodoo, the owner Bob Button, Pursuit Aviation for providing media coverage of the attempt, sponsors Joe Clark and Aviation Partners Inc of Seattle, and of course to Steve-o Hinton himself for realising a dream.